On the outskirts of the bustling city of Waco, Texas is a partially hidden piece of paleontological history of mammoth proportion. Waco is a comfortably sized city, conveniently situated between Dallas and Austin just south of Ft. Worth. Waco is home to many sights and attractions that thrill both the young and the young-at-heart alike. One such attraction is the Waco Mammoth Monument. Situated on 107 acres, the Monument became one of the newest additions to the National Park System on July 10, 2015, by Presidential proclamation from President Barack Obama. On a balmy spring day in 1978, two young men set off on an afternoon adventure in search of arrowheads, fossils and other interesting finds near the Bosque River. As the men were walking down a ravine looking under shrubs and digging in the dirt examining small pointed rocks for the deliberate chipping pattern on the edges in hopes they had found an arrowhead when they discovered a bone. When they first came across the bone, they may have thought, “Cool, an old bone, but it probably came from a cow.” The land that they were walking on was, at one time, an old dairy farm. As they started uncovering the bone, it became rather apparent that what they had found was no cow bone! This bone, which they rightly assumed, was part of a leg, a huge leg because that bone by its own was 3′ tall, nearly half of their height! The young men took the bone to Strecker Museum at Baylor University. There, staff member David Lintz realized that the bone was part of a leg bone from a mammoth, a Columbian Mammoth. Mammoths were quite large animals. They stood 14′ tall at the shoulders, weighed an impressive 20,000-24,000 lbs.! The daily diet of a mammoth consisted much of the same as what modern-day elephants eat today, but in greater quantities. A single Columbian mammoth ate as much as 300-700 lbs. of grass, leaves, and other plant matter and drank as much as 50 gallons of water a day, and in turn, produced about 400 lbs. of dung daily! The tusks of a mammoth could reach lengths of 12-14′ from end to end. For the next 23 years, museum staff members and volunteers explored the ravine, uncovering 23 unique Columbian mammoths. Columbian mammoths are not new, they are found throughout North America. What made the Waco mammoths unique was that eighteen of those remains were from a nursery herd, one that contained only adult females and juveniles, the first and only recorded evidence of a nursery herd of Pleistocene mammoths. As paleontologists and volunteers began uncovering the remains of the mammoths, they discovered three separate natural disasters that caused the demise of the mammoths. The first event drowned the entire nursery between 65,000 and 72,000 years ago. During the second and third flooding events the remains of a bull mammoth, juvenile, a female mammoth, a camel, a tooth from a saber cat, and at this time, an unknown animal were also discovered. The Monument is a unique destination to view paleontological finds such as the mammoths because the bones have been left “in situ.” Meaning the original bones remain in their original found position within the bone bed. Waco Mammoth Monument encompasses 107 acres, but only 2 acres have been fully explored. On the 2 acres, there is a visitor center, preservation hall, gift shop and facilities to host fantastic school tours and special dig sites for students (learn about them here!). Because of the number of specimens found on that 2 acres, the theory is that there is a substantial amount of hidden knowledge and information below the layers of dirt that will help us understand in greater detail what life was like, what lived and the interactions during the Pleistocene Epoch. 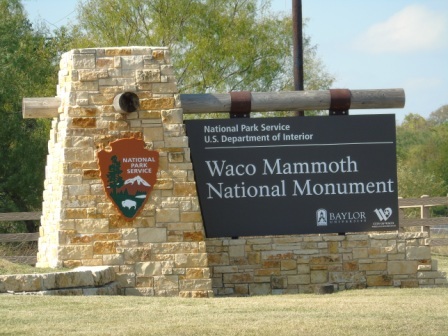 The City of Waco, The Waco Mammoth Foundation, Baylor University, and the National Park System have collaborated to preserve the mammoth remains and to expand the Monument. The preservation hall at the Mammoth Monument is climate and humidity controlled. The walls of the structure extend 25-40′ into the ground to the bedrock below the water table. Also, the windows are situated, so there is no direct sunlight into the building to degrade the mammoth bones. There are at least two additional mammoth remains located within the wall boundaries of the preservation hall that are waiting to be re-uncovered. During construction of the building, one set was discovered where a staircase was being built causing a slight relocation of the staircase. The other set of bones found were where one of the exterior walls were to be constructed, causing that wall to be pushed back an additional 17′. Until an examination could be performed, soil was placed over the bones to protect them from deterioration. The future of the Waco Mammoth Monument is full of excitement and anticipation. Due in part to the combined partnerships and donations from individuals and businesses, efforts to build an on-site lab are being developed. Once the lab is built, excavations can begin again to discover what life was like in Texas in the Pleistocene Epoch, most likely, and hopefully, starting with the two reburied mammoths. For more information about scheduling your own tour, please visit their website, here or call (254) 750-7946. • Tuesdays –Fridays: Open 11:00 a.m. –5:00 p.m.
• Saturdays: Open 9:00 a.m. –5:00 p.m.
National Park passes do not apply to guided tour fees. Please support our preservation mission, access to the Dig Shelter is by guided tour only. I am so thrilled that you liked it! There are so many fun things to do in Waco, Ft. Worth and the Dallas area! What a great post! We’ll have to make it there whenever we’re able to head west!